We have made some updates to our invoices. Invoice line items have now been added to invoice payment forms. This will allow your customer to see a complete breadown of everything on the invoice. Prior to this change we were only displaying the invoice line items in the invoice email. We fixed an error causing occasional problems when attempting to pay an invoice using a saved credit card. 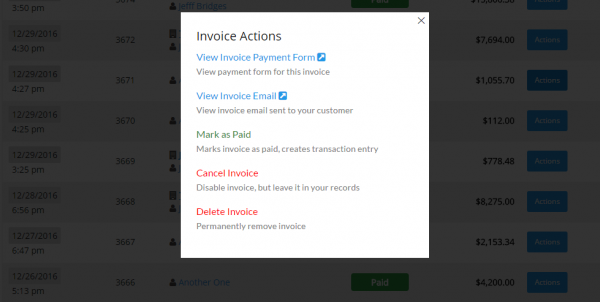 Descriptions have been added for each possible invoice action, so users will have a better understanding of which option to choose.